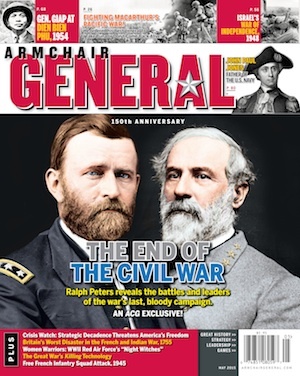 Jerry Morelock | Armchair General Magazine - We Put YOU in Command! Background: Jerry Morelock graduated from the US Military Academy at West Point in 1969, spending a total of 36 years in uniform. A decorated combat veteran of the Vietnam War, Colonel Morelock’s Army assignments included numerous command and staff positions in field artillery units in the US, Germany and Korea, and two tours in the Pentagon. His last Pentagon tour was in the Office of the Joint Chiefs of Staff where, as Chief of Russia Branch, he coordinated US policy in Washington, D.C. regarding Russia and the 15 republics of the former Soviet Union. Colonel Morelock’s final active duty tour was as the Director of the Combat Studies Institute–the history department of the Army’s Command and General Staff College at Fort Leavenworth, KS–a premier position within the Army’s military history community. He not only served as the department head of this outstanding group of two-dozen, world-class military historians, Colonel Morelock regularly taught military history graduate-level courses, served as a member of the Secretary of the Army’s Military History Advisory Board and was the Editor-in-Chief of the Army Staff College’s CGSC Press. Following retirement from active duty, Dr. Morelock was the Executive Director of the Winston Churchill Memorial & Library at Westminster College in Fulton, MO for four years. This is the site of Churchill’s world-famous "Iron Curtain" speech in 1946, marking the beginning of the Cold War. Dr. Morelock received his PhD from the University of Kansas and is a prize-winning military historian whose numerous publications include the books, Generals of the Ardennes: American Leadership in the Battle of the Bulge and Great Land Battles From the Civil War to the Gulf War. Dr. Morelock lives in Fulton, Missouri with his wife, the Russian artist, Inessa Kazaryan Morelock.